Brain Technologies’ Dudley Lynch condenses the nearly 300 pages of his latest book, The Mother of All Minds: Leaping Free of an Outdated Human Nature, into a few highly pertinent questions and answers on getting to the next level. Q. What is a mind level? A. A home base where your mind hangs out. A. Lots of reasons. But mainly because this is the “ground zero”—the sum of everything that you are, that you’ve done and that you’ve believed—so far. Q. So there’s more than one primary “home base” or level for the mind? A. At least seven or eight...so far. Q. What’s the big deal about changing your mind level? A. If you don’t do it at least a few times in your lifetime, you’ll eventually get seriously left behind in a changing world. Q. Has this happen to many people? Q. Is this a threat to their survival? A. Maybe. At the very least, it puts important limits on their ability to make sense of the contemporary world and on the kinds of problems they can solve. And this may, in fact, shorten their lives and almost certainly will diminish the quality of it. Q. Isn’t there something automatic about how the mind changes—I mean, isn’t this what growing up is all about? A. Absolutely. The minds of healthy people who receive care and love and variety and stimulation do tend to keep moving up, at least for a while. Q. Why do you say “up”? A. That’s the way most people think about having more of something. Q. So what does moving to the next mind level give you more of? A. In a word, “happenability”. A. Meaning when you need to do something different, think something different, believe something different, be something different, you can at least have a shot at it. Maybe even making it happen! Q. Isn’t “making it happen” something that most rational, attentive people manage to do frequently when the chips are down? A. Unfortunately, no. One, we humans aren’t really that “rational” much of the time. Two, even when we are acting that way, what we do when the chips are down usually depends on our mind level. You know, the “different strokes for different folks” thing. A. Well, consider what people do when they run out of money. Some rob banks. Some pray. Some starve. Some despair (and a few commit suicide). Some move in with relatives or children. Some take out a loan and go back to school. Some radically change their whole approach to living. Like I said . . . different strokes for different folks. Q. And you say this largely depends on their mind level? A. Pretty much. You see, it depends on what emotions are controlling them. And each mind level has a major emotion or two that controls what happens there (or doesn’t) most of the time. Q. Does this mean that the higher your mind level, the less vulnerable you are to uncontrollable emotions? A. Exactly. Instead of needing your spouse, significant other or a parent or a law enforcement officer or the main religious figure in your life or a stockbroker or your therapist or guru or your friends to tell you to back off and smell the roses or count to ten or look at your options or try something different, you can usually figure it out yourself. And do it while there’s still time to act. Q. How come “levels of the mind” is such a big secret? A. It isn’t. We humans have been figuring this out at least since Sigmund Freud. For sure, we had a near slam-dunk understanding by the 1960s and ‘70s. But what your brain (remember, that’s your mind’s main sidekick) won’t let you see, you can’t acknowledge that you know. And you can’t do something with it. Q. Uh-oh. So my brain is up there messing with my view of the world? A. There you have it, friend! Your brain is often dealing the cards 24/7 in poker games you’ll never, ever know you have a stake in. You don’t know when to hold ‘em and when to fold ‘em because you didn’t know you were even being dealt a hand. When this happens—and it happens a lot—it’s an unconscious thing, something outside your awareness and control that is influencing your awareness and control. A. Among other things, it gets people hurt or killed, starts wars, ruins relationships, destroys children, creates despots, fuels greed, runs businesses and economies into the ground, damages the planet, kills other species and curtails the advance of progress, opportunity, knowledge and good decision-making every second of human existence. Q. Do you have names for these mind levels? Q. Why didn’t you simply call the newest mind level Mind 1.7? A. Because it is so different from the others. Q. Who figured this out first? A. An American psychologist, the late Dr. Clare W. Graves. Q. What did Dr. Graves discover? A. He believed he was the first to discover that some people were making a big leap forward into a truly different, more versatile, more competent mind level. He called it a “momentous leap.” I sometimes call it leaping the gap. Q. What makes such a leap possible? A. There are many ways to try and explain it. One is the idea that our brain is finding more and more ways to “wire around” the parts that send our emotions dangerously out of control. Q. What happens when our brain does this? A. Many positive things. Perhaps the most important is that the newer parts of our brain—the prefrontal lobes of the cerebral cortex—assume greater importance, control, input. And this seems to help us do the things we do best as humans better and more and more often. Q. So when we are using Mind 2.0, or the Beta mind, does this mean that we are less “animal” and more “human”? A. Those are exactly the words Dr. Graves used. Q. Is accessing a new level of mind, such as Mind 2.0, simply an “accident of nature” that occurs only for a few lucky people? Or can you help make it happen to you? A. At Brain Technologies, we believe you can help make it happen. That’s why our life work has been providing people with the tools, technology and wisdom to go looking for higher mind levels and find them. Q. If I want my mind to move forward, maybe even “leap the gap,” where do I start? A. 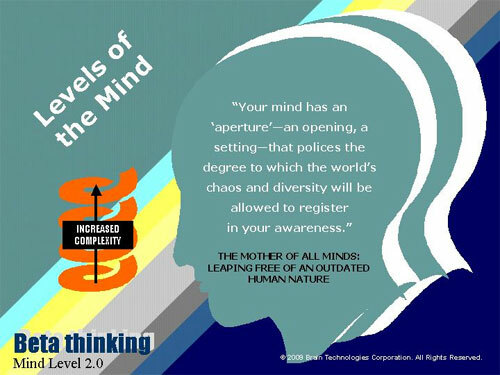 Why not consider reading The Mother of All Minds: Leaping Free of an Outdated Human Nature? It’s my personal gap-leaping story. And just about everything else I can think of that might be helpful to you in your personal quest to think, do and become more.